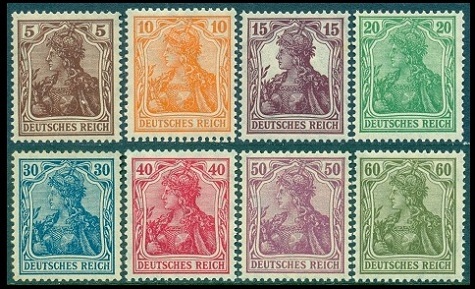 The Weimar Republic continued the use of the Germania definitive postage stamp designs of the German Empire through 1922. 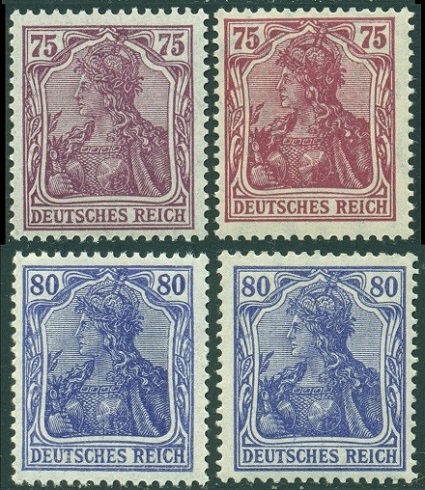 By then, the Germania issues had been replaced by new definitive stamp issues for the republic. Between January 1920 and April 1921, new stamps of the Germania-type definitive design were issued by the Weimar Republic. 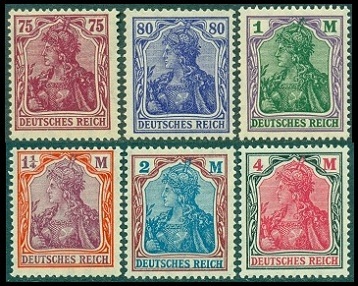 They included new colors on some of the existing Germania issues, as well as four new bi-colored Germania Mark denomination stamps. They are all shown above. As with the last Germania issues of the German Empire, all of these new stamps were Perforated 14 x 14 1/2, and they were watermarked lozenges. All of these new stamps were issued in sheet format, as well as in coils. The 10 Pf., 15 Pf., 30 Pf., 40 Pf., and 60 Pf. denominations were also issued in booklets. Since some of the booklet panes contained multiple denominations, se-tenant combinations of these stamps are collected, as well. Considering the special sheets for the printing of booklet panes had nine rows of stamps and a gutter row, these booklet stamps can be collected as booklet panes of six, tête-bêche pairs, and gutter pairs. 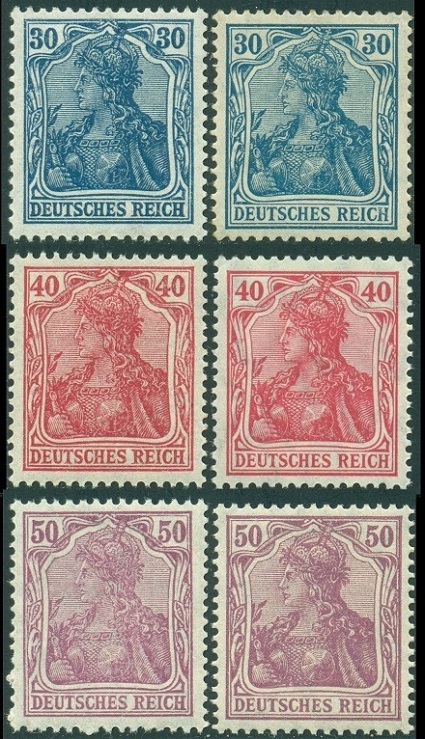 The mint and used sheet stamps, booklet panes, and combination pairs of this 1920-1921 Germania issue are not expensive, thus one can develop quite an attractive and specialized collection of these issues, without spending a lot of money. The 30 Pf., 40 Pf., 50 Pf., 75 Pf., and 80 Pf. denominations come in two types. The Scott Catalog doesn't list them, but the Michel Catalog does. The Type I stamps are from vertical coil rolls. The Type II stamps are from sheets (panes of 100). All of them are shown in the scan above, with the first stamp being Type I and the second stamp being Type II. It might be a good idea to look out for them, as the scarcer Type I varieties can catalog up to 40 times the price of the common Type II varieties. Type I - the numbers in the corner numerals are off-center, the cross at the top of the crown is obscure and barely recognizable, and the "DEUTSCHES REICH" in the bottom white background is shifted, sometimes touching the frame line at the sides of the white background. Type II - the numbers in the corners are better centered, the cross at the top of the crown is outlined and distinct, and the "DEUTSCHES REICH" in the bottom white background is clearer and centered. The easiest way to identify these is by the absence or presence of the distinctly outlined cross at the top of the crown and the centering of the denomination numerals. The catalog details, for the Weimar Republic Germania-type definitive postage stamps of 1920-1921, are as follows. 05 Pf. (1920 - Mi. #140, Sc. #118) - Brown. 10 Pf. (1920 - Mi. #141, Sc. #119) - Orange. 15 Pf. (1920 - Mi. #142, Sc. #120) - Violet Brown. 20 Pf. (1920 - Mi. #143, Sc. #121) - Green. 30 Pf. (1920 - Type I - Mi. #144I, Sc. #123) - Dull Blue. 30 Pf. (1920 - Type II - Mi. #144II, Sc. N/L) - Dull Blue. 40 Pf. (1920 - Type I - Mi. #145I, Sc. #124) - Carmine Rose. 40 Pf. (1920 - Type II - Mi. #145II, Sc. N/L) - Carmine Rose. 50 Pf. (1920 - Type I - Mi. #146I, Sc. #125) - Red Lilac. 50 Pf. (1920 - Type II - Mi. #146I, Sc. N/L) - Red Lilac. 60 Pf. (1920 - Type II - Mi. #147II, Sc. #126) - Olive Green. 75 Pf. (1920 - Type I - Mi. #148I, Sc. #127) - Red Violet. 75 Pf. (1920 - Type II - Mi. #148II, Sc. N/L) - Red Violet. 80 Pf. (1920 - Type I - Mi. #149I, Sc. #128) - Blue Violet. 80 Pf. (1921 - Type II - Mi. #149II, Sc. N/L) - Blue Violet. 01 M. (1920 - Mi. #150, Sc. #129) - Violet & Green. 01 1/4 M. (1920 - Mi. #151, Sc. #130) - Vermilion & Magenta. 02 M. (1920 - Mi. #152, Sc. #131) - Carmine & Blue. 04 M. (1920 - Mi. #153, Sc. #132) - Black & Rose. There are two very famous paper errors in this Weimar Republic Germania series. Some of the 1.25 and 2 Mark denominations were accidentally printed on paper with a quatrefoil watermark. An authenticated example of the rare 1 1/4 Mark denomination (Mi. #151Y, Sc. #210) is shown above. Though rare, they are available, with the Michel value being 600 Euros for a mint lightly hinged example and 1,300 Euros for a used example. This watermark error also exists on the 2 Mark denomination (Mi. #152Y, Sc. N/L). These are exceedingly rare and generally not obtainable, with the Michel value being 50,000 Euros for a used example. In August 1921, the Weimar Republic released the four surcharged Germania stamps shown above (Mi. #154-57, Sc. #133-36). Michel lists two types on the overprint. The first type is a glossy or glazed looking overprint, and the second type is a matte looking overprint. The matte overprint is the scarcer of the two. In 1922, the paper used for printing postage stamps was changed from watermarked lozenges paper to watermarked network / webbing paper. In March 1922, some of the 75 Pf. and 1.25 Mark denomination Germania-type stamps were printed on the new watermarked network paper. They are shown above (Mi. #197-98, Sc. #169, #174). As was the case in the United States, following the American Civil War, with businesses using encased postage stamps as small change, the years following the end of World War I had a devastating effect on the economies and the people of Europe. Similar to the purpose of the encased postage stamps used during the American Civil War, various businesses in the Weimar Republic issued token coins to resolve the coinage shortages caused by the economic collapse following the War. The token shown above contains a 10 Pf. postage stamp and was intended as a substitute for a 10 Pf. coin. The front of the token is an advertisement for Flammenscrift Life Insurance, located in Barmer-Satzkasse, near Frankfurt, Germany.